Branding for Authors—When Do We NEED Marketing & Advertising? Okay so last time we talked about experts and why we need to be careful who we are listening to. Sure some “experts” are really predators. Others mean well, they just aren’t a good fit for what an author needs. Here’s a simple truth that a lot of writers miss and this is so fundamental. Marketing and advertising are NOT brand and platform. These are not all synonyms and interchangeable. Brand/Platform and Marketing/Advertising are distinctively different activities and when writers don’t understand this? They have panic attacks, get overwhelmed and start requesting information on-line for dental hygienist schools while drinking straight from the spout on the boxed wine. You can do this. Calm down. Breathe. My expertise is in helping you guys build the brand and the platform. I am NOT an expert on advertising and marketing. I have no interest in being one either. But what can often happen is that writers believe they need marketing and advertising experts when in fact, they are not yet ready for that. Brands can be built any number of ways. In the olden days, brands and platforms for novelists could only be built ONE way. Books. Good books. And the more the better. Since there was no regular interface with an author, the singular interaction one could have with an author was through the stories he/she wrote. This is STILL the strongest way to create a brand and platform and the reason is this. It takes an average of 12-15 hours of undivided attention to complete a novel. This is a LOT of intimate time with a person. I can’t remember the last time I spent 12-15 hours of undivided attention with my husband or child. This immersion creates a profound intimacy in regards to the feelings a reader has for the author. One of the reasons that the mega authors don’t have to work terribly hard at social media is they already put in their time through lots and lots of BOOKS. I am finishing the unabridged version of Stephen King’s “It.” This means once I finish I will have spent (just with that one book) FOURTY-FIVE HOURS of time with King (and this is not the first King book I have read). Thus the successful authors of the pre-digital age came onto the social media scene with an established brand and platform. And all social media does is help keep that thriving. Ads and marketing also do very well for these authors because they are already household names. One does not have to be an avid reader or member of a book club to recognize the name J.K. Rowling. Walk through any airport and all you see is James Patterson books. For the author emerging onto the digital scene who cannot already put NYTBSA in front of her name, who does not have an extensive backlist, there is some work to be done regarding building a brand and platform since you don’t have one. This is where I come in. Other than books, how can you establish a brand (what people think when they see your name) and a platform (people who will eventually be interested in buying books). 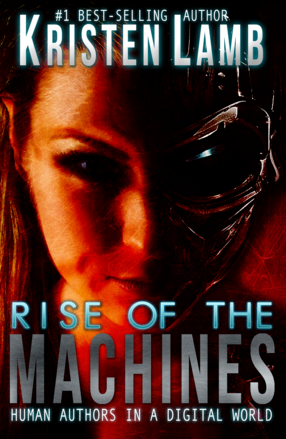 My training is to cultivate that following (those who know you, your voice, your books) and those relationships (those who care) and you can get all of that in one book, Rise of the Machines. I also offer training to make your books (product) as strong as possible thereby enhancing your BRAND. The problem with some “experts” we mentioned last time is they want to skip steps. We can’t blast out newsletters to people who don’t know us let alone care to hear from us. We need to do some relationship building and establish trust and rapport. This is not something that can be outsourced or automated. We need to do the work. And any expert who tries to skip this fundamental step of brand and platform-building? I’d think twice before handing over money. Regular companies offering services or products (restaurants, bars, computer services, vegan body wash) can do this, but that is because they have the big budgets to saturate with ads and marketing. Yet, I will point out that most of these ventures fail. When we rely on ad saturation it is expensive and risky. But we (authors) obviously don’t stop with just the brand (books/blogs) and platform, and this is where experts REALLY come in handy. If brand is WHAT IS IT? And platform is WHO CARES? Then marketing and advertising are simply magnifying these two things that already exist. As I just mentioned, marketing and advertising can only enhance what already exists. Ads work for Starbucks because there is one on every corner and they have a known reputation. Marketing works for Kia because people need cars and see Kias on the road all the time. We know what they are. We KNOW what a Starbucks is. We know what Levis are. We know what all these “things for sale” are and probably have formed an opinion or impression…which is why it makes sense to use advertising and marketing. As writers, will eventually need marketing and advertising and I am here to deliver a simple yet possibly uncomfortable truth. Money and time are in a reciprocal relationship. The more time we spend cultivating the brand and the platform, the less money we will have to fork out on marketing and advertising. The less time we spend cultivating the brand and platform the more money we will have to fork out in marketing and advertising. See, when we try to make marketing and advertising take the place of the platform and brand? That can get REALLY expensive. We can feel free to write the book on our own, never be on social media then hire a marketing team, but the sheer volume of ad saturation it will take to garner attention? That’s gonna cost big. I love marketing and advertising people, but here’s the deal, they are marketers not magicians. The more we do our part (write books, build a social media following, blog), the more they have to work with. The more people already KNOW us. We get a lot more bang for our buck. A lot of writers are paying lots of money for these large email lists to blast out newsletters to people who don’t know them and who never signed up to hear from them in the first place. This has the same ROI as those folks who blast out messages that we have an inheritance in Ghana somewhere if only we will wire five grand via Western Union. Sure, some people DO bite, but you have to send a LOT of emails to get any return. What then happens is the writer blows through a lot of money needlessly for no real results. Very often I hear disenchanted authors who gripe the their book isn’t selling because they don’t have the mega marketing budgets of the NY heavy hitters. Here’s the deal though. NYC spends that kind of cash on Stephen King, and George R.R. Martin, and James Patterson because most folks in the Western world recognize the brand. One doesn’t have to be an avid reader to know Stephen King writes the scary stuff. These authors have a brand and that makes the ads have a good ROI. To do this for an unknown author? Better to pile cash in the floor and set it on fire (my POV). Thus, when we are looking for experts we will fare better if we appreciate that brand/platform is separate from ads/marketing. There are some really brilliant book marketing people out there and even dedicated experts like Rachel Thompson who teach writers how to do a lot of this for themselves. She’s also a great person to go to to find those folks with the marketing mojo you need for your book and I strongly recommend checking out her blog Bad Redhead Media. In the end, remember, experts are great when we find the right ones. The cool part about the digital age is we can look around, make friends and get opinions and referrals from those we trust. And yes, “goofing off” on Facebook or Instagram is platform building. You are forging relationships. Write the books, make the connections and then, once you are ready? These marketing mavens will be happy to dazzle you! ***Will announce April’s winner next post.